Because the popularity of growing marijuana is growing, in general, the amount of interest in using a greenhouse to grow marijuana is growing as well. There are plenty of advantages to growing marijuana in a greenhouse instead of a grow room, although it comes with its own fair share of drawbacks as well, of course. 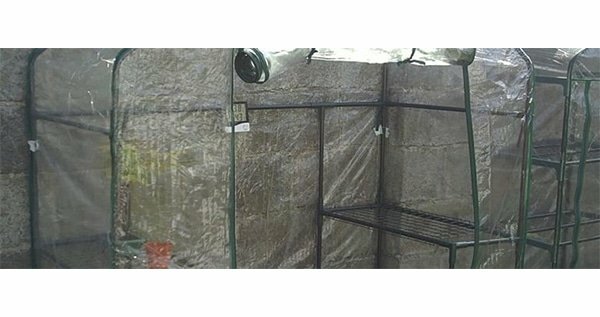 In this article, we will cover some background information on greenhouses as well as the advantages and disadvantages of using a greenhouse to grow your marijuana. The beauty of using a greenhouse to grow your marijuana plants includes the removal of the tricky complexities of an indoor grow room setup. It is also considered by many to be superior to growing outdoors, as it is more secure yet also more consistent and predictable than growing marijuana plants outdoors. It takes the best parts of the natural elements and combines it with protection against the worst parts of the elements, making it the perfect situation especially for growers that are located in northern areas. Although they heat themselves naturally to a certain extent, greenhouses can be heated further when necessary. If you are interested in having a marijuana growing operation to supply your recreational and/or medical marijuana needs, and a greenhouse is a feasible option for you, then you should definitely consider using it. Marijuana that is grown in a greenhouse is particularly well-known for being more potent, so as long as you grow your marijuana from seed with strong genetics, you will find yourself with a very high-quality bud at the end of the growing season. This is precisely why more and more people are switching to greenhouse growing setups instead of indoor grow rooms or outdoor setups. It is sometimes difficult for growers to decide whether they would like to grow their marijuana plants in an outdoor setup or from within a greenhouse. This is especially the case for people who have been growing their plants outdoors with a relatively “hands off” kind of care schedule. In other words, they let nature do its thing, and their marijuana plants generally are successful without too much grower interaction. Wondering whether it is convenient to use a greenhouse? Start small! For these growers, buying and using a greenhouse may seem like a major commitment. Why do that when you could simply let the plants practically grow themselves? When considering this question, try and think about all the negatives that come with growing outdoors. Unexpected weather changes, exposure to pests and diseases, and the even more dangerous — human marijuana thieves — could all ruin your crop any year. Wouldn’t you like to ensure that your marijuana plants are successful this year? When growing marijuana in a greenhouse, you are more likely to encounter pests like small insects rather than deer, rabbits, pets, and birds. This will already ensure the safety of your plants far more than if they were exposed outdoors. A greenhouse is also safer, using the “hiding in plain sight” logic. You can easily have a thriving garden of other plants while intermixing marijuana plants in with them — no one will suspect or see a thing. 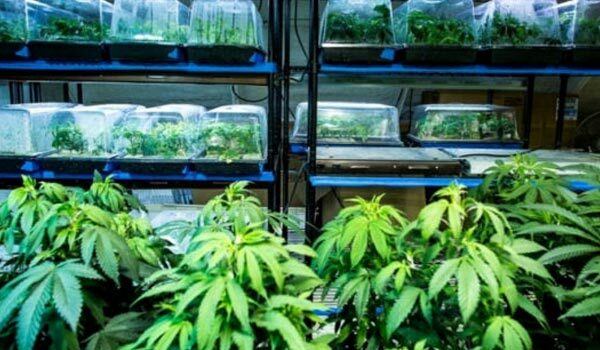 If you are living in a more rural area, you could even get by with growing more than just a couple marijuana plants here and there among your “regular” plants. The key thing to think about in this situation is the smell, which will be stronger. 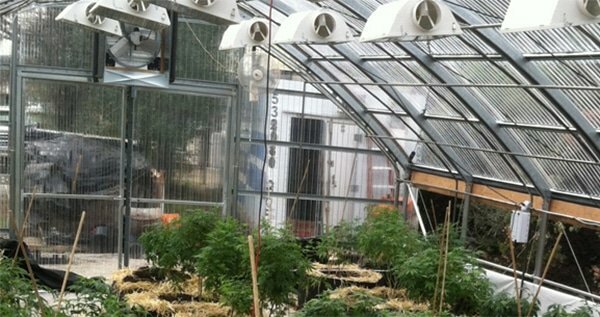 Marijuana grown in a greenhouse can be set up in one of two ways. Either you will grow the plants in separate containers or pots, or you will plant them straight in the ground. There are pros and cons for both options, but ultimately it comes down to what fits best into your lifestyle. If you choose the container route, you will enjoy the fact that it makes it easier to move the growing plants whenever necessary. This is particularly handy if you are frequently visited by people (who you likely shouldn’t share your growing operation with), as you can simply move the plants elsewhere so as not to attract attention. Another reason to move your container-grown plants might include extreme weather coming in. If you decide to plant your marijuana directly into the ground, on the other hand, they will fare much better when they are left alone for a longer period of time (such as a week). Of course, this is only if the soil they are planted in is high quality; if not, replace the old, poor quality soil with better quality soil. A third option does exist for some particularly innovative greenhouse growers: hydroponics. People who have tried it in a greenhouse have had big success, making it a potentially good idea if it suits your lifestyle and experience. No matter what you do with the following information, the most important piece of advice is this: buy high-quality marijuana seeds. It is worth the extra money to rest assured you are setting yourself up for a successful growing season. If you buy cheap, poor quality seeds instead, then you simply cannot achieve the same level of success, no matter how much effort and time you put into caring for your plants. Additionally, be sure to plant these high-quality seeds in high-quality soil. This will give your plants the perfect boost at the very beginning of their lives to build a foundation for healthy growth up through the flowering phase. If you don’t have these two elements, your plant will never reach the monster size that greenhouse plants are well-known for. The key is to think about each individual seed as an individual investment. Just a few seeds could actually feed your marijuana needs for an entire year if grown properly. When thinking about it like that, it provides the proper motivation to prioritize the needs and care of each seed as much as possible. One of the best things about really intricate greenhouse growing setups is the fact that it can be highly automated. In other words, it can be much easier for the grower because they don’t need to do as much day-to-day care for their plants. One such automated system is a watering system that delivers water to the plants automatically, or with little effort on the grower’s part. You may want to consider installing some automated systems of your own if you are the type of person who enjoys planning such things ahead of time, if you have a high enough budget for it, and if you don’t enjoy the daily tasks of marijuana plant care as much as the setting up process. One good way to keep your marijuana plants safe from detection if the greenhouse is not located in an inconspicuous or private location is to paint the exterior with white shading paint. You can find this at a garden center, and it serves the dual purpose of preventing the greenhouse from getting far too hot on the warmest days during the summer. When you have a painted greenhouse, people will not be able to peer inside and identify what you are growing. An additional idea for people who just want to grow one or a couple marijuana plants is to actually grow tomato plants and use green plastic plant mesh so that they can have a secret one or two marijuana plants growing in the corner or amongst the tomato plants. To truly take advantage of growing your marijuana plants inside a greenhouse, try starting the growing season early this year. This is possible because greenhouses will get much warmer than the outside temperature once the sun comes out. When you start the growing season earlier, you have more time for the vegetation phase of your marijuana plants. When you have more time for the vegetation phase, your marijuana plants will be bigger and stronger for the flowering phase. As a result, your harvest at the end will be much better. The key to doing this successfully is not to allow the greenhouse to get too cold at night during the early part of the season. You can do this by installing greenhouse heaters, found at your local garden center, to be run during cold nights. This ability to lengthen the growing season for marijuana plants is one big reason why and an increasing number of marijuana growers are opting to grow their plants in a greenhouse instead of an indoor or outdoor setup. These plants have the opportunity to grow far greater in size than their outdoor counterparts, assuming the seed genetics, soil, and other care aspects are sound. Believe it or not, some growers have even opted to grow just one big plant in their greenhouse setup — and that plant gave them hundreds of grams of high-quality buds at the end of it. If the plant starts getting too out of control, it could actually start growing out through any open windows that might be in your greenhouse, and therefore steps need to be taken to “tame” the plant. This is best done via tying techniques. Many greenhouse growers will opt to use what is known as a “darkening” system which, when set up correctly, should be dark enough that there is a complete blackout within the greenhouse — even during the middle of a sunny afternoon. The point of installing a darkening system is to simulate shorter days and longer uninterrupted nights, thus spurring your marijuana plants into an early flowering phase. This is an expensive addition, but it will certainly ensure that you acquire your weed much faster than if you waited for the natural sunlight conditions to change over the course of the season. The way to “trick” your plants into entering the flowering season early is to have 12 hours of uninterrupted darkness and 12 hours of sunlight every day without fail. The darkness is the most important part of this process — you must not allow any light in at any point, even for an instant. After a couple weeks of this, you should start seeing signs of flowering. A greenhouse can also be the perfect environment for manipulating the length of the end of your marijuana plants’ growing season. Many growers choose to use this to their advantage and lengthen the end of the growing season. The main reason why a greenhouse is beneficial in this way is that it keeps the air around the plants (in other words, the air inside the greenhouse) toasty warm when it is sunny while the colder temperatures of the fall are creeping in. If you are just looking to do your best by your marijuana plants, you are going to need to remember a few pieces of advice that will lead to happier and healthier marijuana plants year after year. First of all, make sure to add new, healthy, high-quality soil every new year of growing. Buying it once and reusing it over and over simply will not do. Just like if you were growing in an indoor setup, make sure you keep your greenhouse as tidy as possible at all times. This will help keep things like pests and diseases at bay in case they do come in contact with your marijuana plants. For the safety and security of both you and your plants, you could try using fencing that has been placed in strategic locations (keeping it as inconspicuous as possible) to keep people who shouldn’t be there away from your greenhouse. It will additionally help anyone discovering it accidentally simply by looking at or into your greenhouse, and that means better security for you. If you are buying the greenhouse now, you can make a strategic decision about which type of greenhouse to purchase. Some of the newer polycarbonate greenhouses, for instance, are already opaque and often come with doors that have locks on them. This will keep both people and eyes away from your precious marijuana plants. You can buy any size or shape of greenhouse you like, and you will luckily find that they are relatively inexpensive. If you are growing more than one or two marijuana plants, you are going to need to deal with the potent smell. It will be stronger with many marijuana plants packed into a greenhouse, and unlike an indoor marijuana setup, you cannot simply use a carbon filter to get rid of the smell because the humidity will be so much higher here. If it is really a problem, the only way to get rid of the small will be to extract it via an in-line ozone generator. Which type of greenhouse should you buy? If you have decided on a greenhouse but aren’t sure where to go from there, rest assured that the next step is simple. You simply need to choose the type that you would like to invest in. The short answer is no. When it comes to greenhouses, cheaper is not better. If you pay very little for a greenhouse that is inexpensive, flimsy, and portable, you will not have the best results you could. If the wind picks up, the greenhouse could actually fly away. If the heat on a summer afternoon is too much, it will absolutely roast your marijuana plants. Don’t try cutting costs in this way. The most common type of attached greenhouses are lean-to greenhouses. Just like their name implies, lean-to greenhouses are greenhouses that lean up against the outside of your house or another building. These greenhouses are particularly efficient because they get any of the heat that leaks through the wall of your house, keeping your plants even warmer without any extra effort, and they are half the size of a normal greenhouse. Lean-to greenhouses could be perfect for someone who does not have the lawn space for a full-sized free-standing greenhouse, or if you only want to grow a couple plants. They also have lower materials costs because one wall of the greenhouse already exists. One downfall with attached greenhouses is that they are limited in their position to where the wall of the structure is that they will be leaned up against. Greenhouses that stand on their own generally come in the shape of an apex (such as a house). Their frames are often made of wood or aluminum, which brings up an important point: remember that the sun cannot shine through wood or aluminum, and therefore shade will be created. If the frame is particularly thick, there will be more shade in your greenhouse. More shade means less sunlight for many of your plants, so avoid really thick frames if you buy a free standing greenhouse. Freestanding greenhouses, also known as detached greenhouses, have the major advantage of being able to be placed just about anywhere. They are not limited by a permanent structure like attached greenhouses are, meaning you can position them for optimal conditions. You will often hear free standing greenhouses referred to as A-frames or even-spans, given the fact that those designs are most often found on the market. A connected greenhouse is one that includes multiple greenhouses that have been attached to each other. They work well for commercial operations so that one large space can be formed for many plants to grow. It maintains one controlled climate for temperature and other environmental elements, making the operation and energy and cost-efficient as possible. Most commonly found in commercial farming, polytunnels can also be bought in a smaller size more suitable for domestic uses. Their frame is curved and made of aluminum, with a stretch of a polythene sheet draped over it so it is a solid form. This is one way of cutting the short-term costs of your greenhouse marijuana growing operation, as polytunnels are generally cheaper than other types of greenhouses. That being said, you will need to replace the polythene sheet once every three to five years. Serving as one of the smaller and more temporary counterparts to the other types of greenhouses, cold frames are climate-controlled and inexpensive, often made at home by the grower. It is formed by using a cheap plastic or wooden structure that is then covered with clear plastic or glass. If using glass, it should be thin plate glass; plastic should be thick so it doesn’t tear and can maintain the climate control. Cold frames are heated only by the sun — which makes them a worse choice for locations with unreliable or extreme weather. If you add a heating system to a cold frame, it is now called a hotbed. Hotbeds, like cold frames, can be whatever size the grower wants them to be. Either it could be a large box that fits just one plant, or it could be a large structure that is big enough for the grower to walk and move around in. If you are looking to have a large, climate-controlled structure, however, it is often better to choose one of the above, more permanent and reliable options instead. The second thing you need to think about is what size greenhouse you would like to go for. Generally speaking, a good rule of thumb to remember is always to get a size of a greenhouse that is one size larger than the one you originally wanted to purchase. It will help you have a little extra space to maneuver in, and it can be used to store equipment and other growing supplies if you have enough extra space. Another aspect to consider when purchasing your greenhouse is whether to get one with diffused or semi-diffused coverings or panels or if you should opt for clear panels instead. It is usually a good idea to choose diffused or at least semi-diffused, despite what you might think is common sense. Clear paneling allows more direct sunlight to hit your plants, a fact that is of particular importance in their earliest and most vulnerable stages of life. However, it will also keep your greenhouse a bit warmer than diffused paneling. Still, it is better to choose diffused or semi-diffused. This is because light that is being diffused is less likely to be competed for amongst the plants when they are older, and will keep any hot spots from starting to develop within your greenhouse. It will help even out the light that is hitting your plants, thus encouraging even growth, and will help your yield have a higher average yield. One of the toughest aspects of greenhouse marijuana growing is keeping the temperature at a steady and healthy level. This is especially true for those who have never done any type of greenhouse growing before, as the temperature is completely different from an indoor marijuana grow setup or an outdoor grow area. The key is to keep your greenhouse warm when the weather is cool, and cooler when the weather is too warm. When you are deciding on a greenhouse, you should, therefore, think long and hard about ventilation. Essentially there need to be vents in the glazing if you want to keep a healthy growing environment for your marijuana plants. Measure the vents and take the combined area of all of them. If this is not equal or greater than one-fifth of the area of the greenhouse floor, you are going to need to get more vents. It is very important to maintain the entering and extraction of air in your greenhouse, or else your plants will be absolutely overheated during the hot days. An ideal greenhouse would include vents at the top (for air to leave the greenhouse) as well as at the bottom of the structure (for air to enter the greenhouse from outside). You can have manually operated vents as well as automatic vent openers, the latter of which will provide you with a better growing experience. It is a relatively simple device with wax inside of it that expands in the heat and shrinks in the cold. This causes the vent to open and close according to the appropriate temperatures. It will let you rest assured that your greenhouse will remain the proper temperature, even without you running back and forth to open and close all the vents. Exhaust fans are also a possibility for certain types of greenhouses, allowing for an added layer of heat defense. There are plenty of environmental aspects you should consider when deciding where to place your greenhouse. In an optimum environment, your greenhouse will sit in a place that allows your plants to be hit with between five and seven hours of direct sunlight every day. This is best achieved by facing the greenhouse southwards. Generally speaking, more direct sunlight equals a higher yield, so think about this part carefully. Additionally, direct sunlight as early as possible in the morning has an added benefit: it helps prevent mold from developing. In the morning, dew can easily get trapped in your marijuana plants’ buds, causing a buildup and then the formation of mold over the course of several days or weeks. If you have direct sunlight early in the morning, however, it will help keep these moisture levels down to a minimum — but of course, this needs to be combined with proper greenhouse ventilation. Now, the actual growing part of the greenhouse marijuana setup. You will need to choose an appropriate strain, (depending on your location and climate), gather your top quality soil, and your setup is complete. If you live in the Northern Hemisphere, your seeds will need to be sown in April. This allows them to be moved to your greenhouse by the middle of May. Begin growing them indoors with a propagation light, and move them outside for several hours per day to help get them used to direct sunlight. This works similarly to a person tanning in preparation for a sunny vacation, or a mountaineer doing small, high-altitude hikes in preparation for climbing a mountain with minimal negative impact. You can expect your plants to be in their vegetation stage throughout May and June, and will start entering the flowering phase after the longest day of the year has passed. This is because the sunlight will decrease every day, and when the plant “notices” this it begins to flower in an attempt to fertilize and produce seeds. You can expect your marijuana plants to flower for eight or twelve weeks (unless you have applied a method of lengthening or shortening one of the lifecycle phases). In other words, the harvest time will roll around between the end of September or beginning of October and the beginning of November. If you have a climate similar to England (less sunlight, more rain), then you may want to look into buying autoflowering marijuana seeds rather than regular photoperiod ones. In case you are not already familiar with autoflowering plants, they are the type that begin flowering after a certain amount of time has passed rather than once the light conditions change in a certain way. Autoflowering marijuana plants for climates like these are particularly useful when grown in a greenhouse. Simply choose a time when the weather is warm enough, grow them for 60 or 90 days (depending on the variety you purchased), and rest assured that they will flower properly. That being said, you can expect smaller plants. But of course, with a tricky climate like that, you couldn’t expect monster buds in the end anyway. An additional benefit of growing autoflowering marijuana plants in a greenhouse is that, due to their shorter life cycle, you could actually get in more than one harvest during a growing season. If timed correctly, you could harvest once mid-summer and once a the normal harvest season — or perhaps you are particularly ambitious and want to try for three harvests. In this way, your greater number of harvests can make up for the smaller plants and yield. Greenhouse lighting is considered any kind of lighting that comes from a source other than the sun. Generally speaking, this lighting is going to look similar to an indoor grow room setup. Your greenhouse may or may not need supplemental lighting, so it is important to understand the potential reasons for installing it. First of all, extra lighting can prove useful if you need to have a longer period of sunlight for certain plants (i.e. seedlings or clones), or to keep a group of plants from flowering quite yet when the natural sunlight has gone down to a short enough time that it would naturally flower otherwise. If you are adding extra lighting due to the former, you will also need to be able to create a partition between the plants you want to give the extra light to and the plants that are continuing with the natural sunlight growth. Another reason to add extra lighting is if you are growing marijuana plants during the off-season when the natural light (such as the short winter sunlight) will not be adequate to complete a growing cycle. The more growing cycles you can get out of a year and a greenhouse, the more harvests you will get. And that, of course, means that your pricey investments (including the cost of the extra lights, not to mention the greenhouse itself) will pay off in a shorter amount of time. If you want to add lighting to your greenhouse setup, you should try hanging HID lights over your marijuana plants. When the sunlight has dropped below 10 hours per day, begin using the HID lights so that your marijuana plants can get their 12 total hours of light per day. Because you are growing in a greenhouse, you are doing the more economical and efficient method of growing during the winter. This is because you are utilizing whatever sun does exist in the winter, and that means keeping your lights powered down for longer amounts of time every day. The less you use your lamps, the lower your energy costs (and bulb replacement costs) are going to be. Using that logic, it’s hard to understand why more people aren’t growing marijuana in greenhouses throughout the winter. Thanks for reading. Please leave comments or questions below and don’t forget to download my free grow bible. For any grow related question please visit the marijuana support page. Thank you for this network. Presently I own property in Atoka,Caddo,and Grady County Oklahoma.. Please reccomend builders, irrigation, and any logistics company's in Oklahoma. Legalization of Medical M.J. will be on the ballot this year.Thanks. Hello, I live in the south west of Australia,ILGM site is just awesome,although I have been growing many years Iam always reading new information every day like I said just awesome.keep up the good work. Mark. Kirk, By placing 50-60% shade cloyh over and around your hobby house; You can lower temps 15-20 degrees. I know people out there that grow with LED lights. More and more people I know, especially growers with big indoor gardens, are incorporating LED lights into their gardens, or are going LED altogether. I'm interested in the greenhouse effect and would like more information about the size and widths. I f you can send me some prices. Hi Julian, best hop onto the support forum. Our experts there can help you out with your greenhouse requirements. What is the best way to get rid of potent smells in a polytunnels 4'x4' green house with 6 plants? I already have 12 hours each sun/ night. Should I use darkening? I am doing a greenhouse grow in southern California currently but using 6mil clear plastic, should I invest in something else? I was also considering LED lights over HID, opinions on that? I would love more info on how you built your greenhouse if your still out there. Thanx. most interesting. i am building a 3mx3m greenhouse. i intend to grow Autoflowering all year long (plant a pair of seeds every month) do you believe that to be possible? pS. i live in johannesburg sA.